Hope you can all make it to this show on Friday! It should be a fun time. The Post Family all began when a group of semi-like minded chaps bonded over excessive amounts of time on the computer. Oh, our poor young eyes, so weary. All the time, producing these virtual products that are here today, gone tomorrow. We romanticized about studio arts and began to crave the smell of letterpress ink, springy squeegees and dirty fingernails. Something more tactile. Some physical labor for gosh sakes! Moving into our sixth year, those laptops haven’t completely gone away (we figured we’d be back on the abacus by now), but our time on them has been more and more influenced by our interests in skilled trades such as printmaking, ceramics, furniture making and custom typography. So, in celebration of hand-craft that inspires us to get our hands dirty, we bring you ‘Manual Labor’. Our Spring showcase focused on such things as letterpress printing, product design, small batch brewing, sign painting and handmade knit-wares. 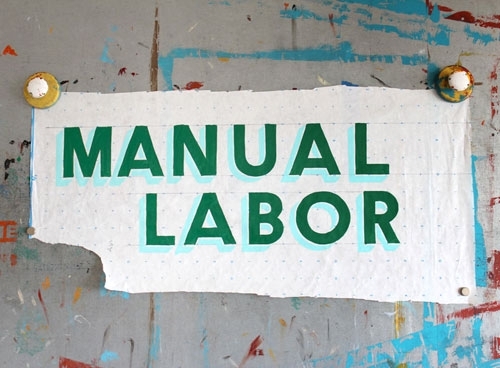 ‘Manual Labor’ opens May 11, 2012, 7-10pm, at The Post Family Gallery, The Family Room. This show will exist for one special night with the opportunity to make appointments the month following. Posted in UncategorizedBy Sharon B.